Minimalism is a new trend that has taken Americans by storm. Minimalists live with the bare essentials in a small space or home. Some people are even giving up their things and choosing to live in “tiny homes”, keeping their living quarters neat and simple. If you are like me, minimalism won’t work for you or your family. No matter how hard I try, I keep finding stuff I want to buy and keep. Do you have a junk drawer like I do? How does all of that stuff accumulate so quickly? And what is really in there anyway? In all honesty, I may suffer from a small case of hoarding. I like stuff. And if I find something I like, I will probably buy multiples of it. I like to keep things that make me happy. I never throw away birthday cards, letters, or pictures. Those things hold memories and sentimental value for me, so I refuse the give them up. If the item has a special memory attached to it, I am more than likely not going to throw it away. Over time, having some stuff becomes having a lot of stuff. Because we are a military family, we move often. Every couple of years we pack up and move to another place, and each time I am always forced to sort through and organize my things. For this reason, I have become more mindful of what I hold on to and what I am willing to get rid of. There is a difference between trash and clutter. Get rid of the junk and organize what is left. Before you start throwing things away, start by de-cluttering your space. 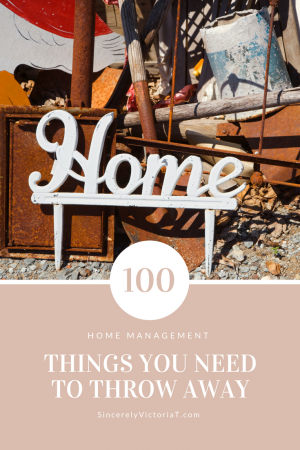 Look through each room of the house and evaluate the things you are considering getting rid of. If some things are salvageable, you can give them away or donate them. There are always local elementary schools, shelters, and thrift stores looking for second-hand items and donations. If there are some things that are in great condition, consider selling them on eBay for a cash return. All other things should just go in the trash. You would be surprised at the amount of clutter that is sitting in your home and office that you can get rid of. What is old to you may become someone else’s brand new. What do you need to get rid of? Share in the comments below.